Bring your strength training home with one of the most trusted and respected names in fitness with the Gold's Gym XRS 20 Olympic Workout Bench and Rack. 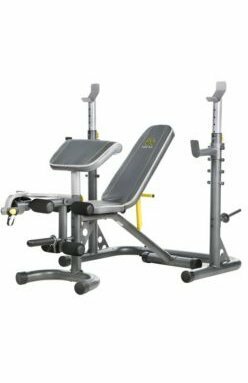 Features of the Gold's Gym XRS 20 Olympic Workout Bench and Rack includes 1.) an independent utility bench and 2.) an independent rack that accommodates Olympic bars. The Gold's Gym bench comes built with a 6-roll leg developer and preacher pad. The rack includes a squat station and safety spotters that help prevent accidents while exercising. You can build up your quads, hip-flexors, and hamstrings with the 6-roll leg developer. The curl yoke helps develop the muscles in your upper body. Each feature of the Gold's Gym XRS 20 Olympic Workout Bench and Rack helps you up your total body strength training game.